With so many articles about the health benefits of broccoli already written, I would like to review broccoli’s benefits in the light of its effect on our glutathione levels. This is the perspective that will, hopefully, help you appreciate this nutritional powerhouse of a vegetable even more, and entice you to include broccoli into your diet every day. Other cruciferous vegetables with the health benefits similar to those of broccoli are Brussels sprouts, cabbage, cauliflower, kale, bok choy, collard greens, Swiss chard, turnip greens, mustard greens, and kohlrabi. One of the main health benefits of broccoli is the ability of broccoli phytochemicals to affect glutathione levels. One of them is sulforaphane, a organosulfur compound belonging to the family of isothiocyanates. Sulforaphane is produced upon chewing broccoli (and other cruciferous) when the compound glucoraphanin is transformed into sulforaphane by the enzyme myrosinase. Young broccoli sprouts have an estimated 10-50 times more glucoraphanin and thus sulforaphane than mature broccoli florets. There is a multitude of studies (on cell culture, animals and in human subjects) proving that sulforaphane is capable of improving glutathione status through such enzymatic upregulation. The scientists have recently identified even the mechanism of action through which this upregulation occurs – sulforaphane induces the activation of transcription factor Nrf2, a protein and a master regulator of redox state in the cell. Cellular antioxidant response is dependent on the antioxidant response element (ARE) which is found in the encoding genes. Nrf2 factor binds to the ARE and activates gene transcription which in turn induces the activity of the enzymes. To put it more simply, sulforaphane activates Nrf2 factor that binds to the ARE which activates the genes whose expression is essential for the activity of the most important antioxidant and detoxification enzymes of the GSH system. This Nrf2-ARE pathway also activates the enzyme gamma-glutamyl cysteine ligase, the first enzyme involved in the creation of a glutathione molecule and a known limiting factor of glutathione synthesis. Nrf2 also activates the xc-system (amino acid exchange transporter) which facilitates cystine (bonded cysteine) uptake into the cells for the synthesis of glutathione. Cysteine is the rate-limiting factor of how much and how fast cells can produce glutathione. (Effect of Nrf2 activators on release of glutathione, cysteinylglycine and homocysteine by human U373 astroglial cells. Steele ML, Fuller S et al. Redox Biol. 2013 Sep 12;1:441-5). The ability of sulforaphane to optimize the activity of the whole glutathione system through the gene pathways makes this compound an indirect antioxidant, detoxifying and anti-inflammatory agent that works on molecular level – these are the main and most important health benefits of broccoli with possible application in various health conditions. Increase oxidative stress within isolated cancer cells and induce their apoptosis (cell death). (Sulforaphane induces oxidative stress and death by p53-independent mechanism: implication of impaired glutathione recycling. Ferreira de Oliveira JM, Costa M, Pedrosa T. PLoS One. 2014 Mar 25;9(3):e92980). Show substantial improvement in behavior, social interaction and verbal communication in patients with autism. (Sulforaphane treatment of autism spectrum disorder (ASD). Singh K, Connors SL et al. Proc Natl Acad Sci USA. 2014 Oct 28;111(43):15550-5). Suppress the Helicobacter pylori infection and exert an antioxidative effect on gastric mucosal damage. H. pylori bacteria are a well-known underlying cause of gastric ulcers and gastric cancer. (The Effects of Broccoli Sprout Extract Containing Sulforaphane on Lipid Peroxidation and Helicobacter pylori Infection in the Gastric Mucosa. Chang YW, Jang JY et al. Gut Liver. 2014 Oct 7). Additionally, the review of 6 cohort studies and 74 case-control studies on the association between consumption of crucifers (brassicas) and cancer risk in humans showed that all cohort studies indicated inverse association between the consumption of crucifers and the risk of lung and stomach cancers. Out of the case-control studies 64% showed an inverse association between consumption of one or more cruciferous vegetables and risk of various cancers. (Brassica vegetables and cancer prevention. Epidemiology and mechanisms. Van Poppel G, Verhoeven DT. Adv Exp Med Biol. 1999;472:159-68). A population-based, case-control study of the fruit and vegetable intakes and prostate cancer risk in 1230 men concluded that high consumption of vegetables, particularly cruciferous vegetables, is associated with a reduced risk of prostate cancer. (Fruit and vegetable intakes and prostate cancer risk. Cohen JH1, Kristal AR, Stanford JL. J Natl Cancer Inst. 2000 Jan 5;92(1):61-8). Cyanohydroxybutene (CHB) is another compound in broccoli that can potentially raise glutathione levels in the liver and the pancreas. However, it is a challenge to find a balance to avoid toxicity and safely raise glutathione in both of these organs because, unfortunately, large doses of isolated CHB are toxic. All the research done with it so far is on rats only and very limited in number. Because of its toxicity CHB is even used as a glutathione depleting agent when researchers need to investigate some other glutathione boosting therapy. The oral dose of 300 mg/kg is hepatotoxic in rats. While a lower dose of 200 mg/kg is safe for the liver and even raises liver glutathione, this dose causes severe pancreatic toxicity. A single oral dose of 100 mg/kg and multiple lower doses (50 mg/kg daily for 3 days or 30 mg/kg for 6 days) cause a significant and persistent increase in glutathione levels in the pancreas, but hepatic levels remain unchanged. (Separation of the toxic and glutathione-enhancing effects of the naturally occurring nitrile, cyanohydroxybutene. Wallig MA, Kore AM et al. Fundam Appl Toxicol. 1992 Nov;19(4):598-606). Based on this study’s results the lowest safe doses of CHB may be beneficial for pancreatic glutathione levels but not for liver glutathione. 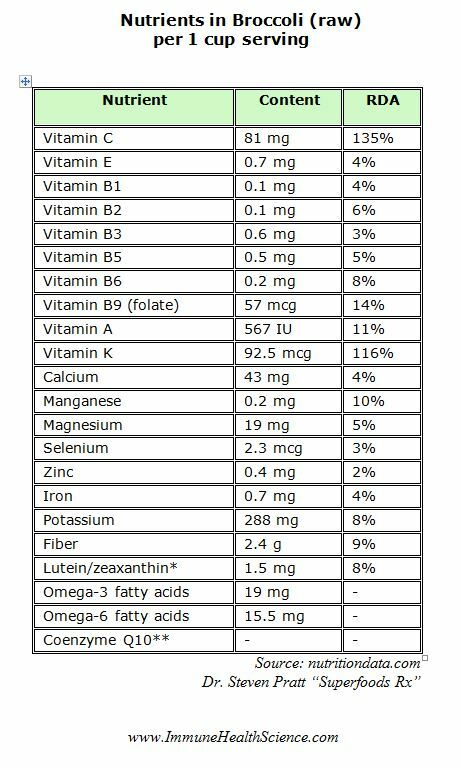 Dietary CHB is safe for humans because it is not isolated and the amounts are quite low in broccoli and other cruciferous. However, supplemental CHB is unlikely to ever be developed. Another group of cancer chemopreventive phytochemicals in broccoli are indoles. The most well-known indole in broccoli is I3C (indole-3-carbinol) which is considered to be an especially effective chemopreventive agent. I3C also stimulates the phase I and II detoxification enzymes of the glutathione system both in the liver and the cells, but also helps fight cancer through its effect on the hormone estrogen – it blocks estrogen receptors in cancer cells and inhibits the growth of estrogen-sensitive breast cancer. I3C is also able to activate cancer cell suicide genes p53 and p27. In his book “Natural strategies for cancer patients” Dr. Russel Blaylock writes that “studies indicate that the effective dose of indole-3-carbinol is 300 milligrams a day”. Less studied and less known chemopreventive compound in broccoli is diindolylmethane (DIM). It is related to I3C but does not appear to have the same hormone-influencing properties. Nevertheless, research indicates that it can inhibit the formation and growth of breast cancer. One recent study showed that oral DIM supplementation at a dose of 300 mg/day for 4-6 weeks increases BRCA1 mRNA expression by 34% on average in women with a BRCA1 mutation. This mutation that prevents BRCA1 gene expression is a major risk factor for developing breast cancer. (BRCA1 mRNA levels following a 4-6-week intervention with oral 3,3'-diindolylmethane. Kotsopoulos J, Zhang S. Br J Cancer. 2014 Sep 23;111(7):1269-74.). There are also studies with cell cultures and animals that indicate DIM’s potential in the prevention and treatment of prostate, lung and gastric cancers. 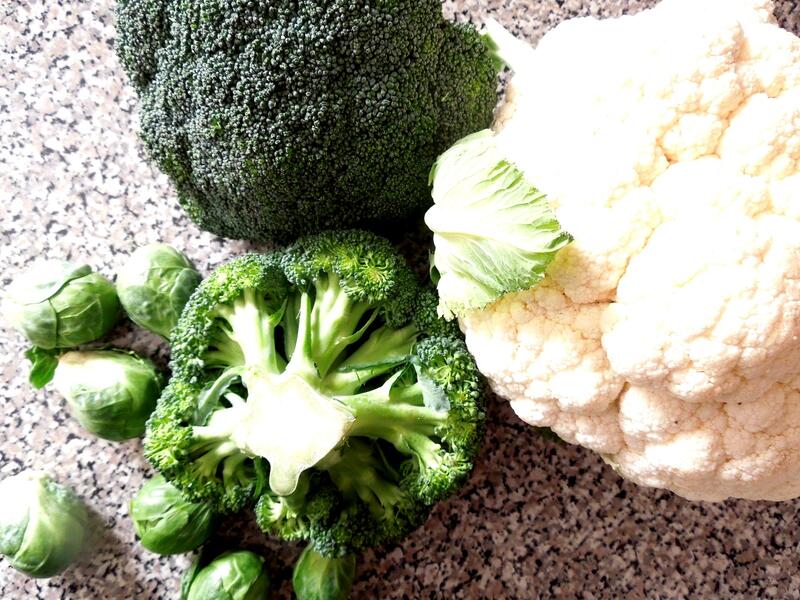 In addition to the potent phytochemicals broccoli provides good amounts of the vitamins and minerals many of which are glutathione cofactors required for the proper formation and functioning of the glutathione molecule and its related enzymes, all working in synergy with the phytochemicals to maximize the health benefits of broccoli. Folate is not only a crucial glutathione cofactor, but is also essential in preventing neural tube defects in developing fetuses. *Lutein and zeaxanthin are the carotenoids concentrated in the retina and the lens of the eye. They serve to protect the eyes from UV damage and have been proven to help lower the risk of developing cataracts and macular degeneration. There is no RDA for these two nutrients but many nutritionists set the daily target at 12 mg.
**Broccoli is one of the few plant sources of the coenzyme Q10 (CoQ10) with its levels assessed as moderate. This antioxidant contributes greatly to energy production in mitochondria and also plays a role in cardiovascular health. Our bodies produce CoQ10, and there is no RDA set for this nutrient. Manganese is part of the antioxidant enzyme manganese superoxide dismutase (Mn-SOD) produced by our cells’ mitochondria to combat the effects of highly toxic superoxide that our immune system deploys against various pathogens. Broccoli provides a good amount of manganese thus participating in this important antioxidant action. Methylsulphonylmethane (MSM) is another organic sulfur compound in broccoli that contributes much needed sulfur to the glutathione molecule, is necessary for healthy and pliable cell membranes, for proper functioning of vitamins B1 (glutathione cofactor) and B7, for strong nails, hair and skin, and has been scientifically documented to have other health benefits (you can read more on our page about MSM). Broccoli is one of the few plant sources of alpha lipoic acid, although the amounts are very small. Alpha lipoic acid is a glutathione cofactor and is known to raise glutathione levels. Health benefits of broccoli do depend on the condition of this vegetable and the method of preparation. Tight, dark green broccoli florets contain more phytonutrients, the deeper the color the better. It is better to buy broccoli florets only, without the stalks, because florets are where all the nutrients are concentrated. This means you get up to 30% more nutrients for the same weight/price. One study concluded that the cancer-chemopreventive health benefits of broccoli are about three times greater in raw than in cooked broccoli due to the loss of enzyme myrosinase to heat. This is the enzyme that converts glucoraphanin into sulforaphane. (Disposition of glucosinolates and sulforaphane in humans after ingestion of steamed and fresh broccoli. Conaway CC, Getahun SM. Nutr Cancer. 2000;38(2):168-78). Vitamin C content is reduced by as much as 50% in boiled broccoli. Other nutrients leech into water as well. So, if you prefer cooked broccoli, it is better to lightly steam or sauté it, being careful not to overcook. Overcooked broccoli loses its crunch and changes the color from bright green to seaweed yellowish-green color. MSM is a highly volatile compound and most of it is lost in the steam. To take advantage of MSM health benefits only raw broccoli will do. 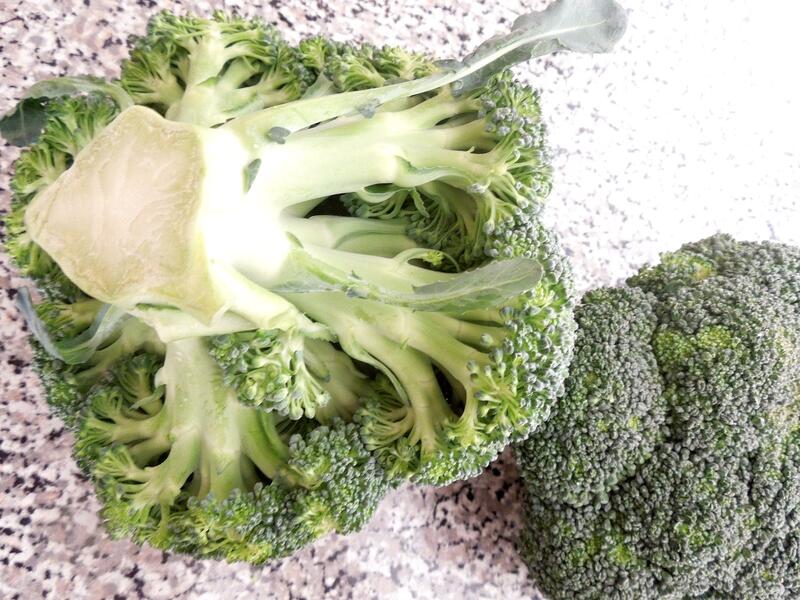 While raw broccoli provides vitamin C, MSM, sulforaphane and other phytochemicals and nutrients intact, cooked broccoli makes carotenoids lutein and zeaxanthin more bioavailable. Broccoli (and all other cruciferous vegetables) contains goitrogens, naturally-occurring substances that suppress the function of the thyroid gland by interfering with iodine metabolism in the thyroid. Excessive consumption of broccoli may lead to thyroid enlargement (a goiter), especially in people whose thyroid function has already been compromised. Nevertheless, even 2 cups of broccoli or Brussels sprouts a day is considered perfectly safe, according to Dr. Steven Pratt, the author of “Superfoods Rx”. Also, steaming broccoli reduces the goitrogenic effect. To maximize the health benefits of broccoli, try to eat at least 1/2 - 1 cup of this vegetable every day, both raw and lightly cooked (steamed). As always, consult a healthcare professional about any changes to your diet. 1. "Superfoods Rx" by Dr. Steven Pratt. 2. "Natural Strategies For Cancer Patients" by Dr. Russell Blaylock. 3. "The Power of MSM" by Dr. Earl Mindell. 5. Sulforaphane reduces the alterations induced by quinolinic acid: modulation of glutathione levels. Santana-Martínez RA, Galván-Arzáte S, Hernández-Pando R et al. Neuroscience. 2014 Jul 11;272:188-98. 6. Sulforaphane, a cancer chemopreventive agent, induces pathways associated with membrane biosynthesis in response to tissue damage by aflatoxin B1. Techapiesancharoenkij N, Fiala JL, Navasumrit P et al. Toxicol Appl Pharmacol. 2015 Jan 1;282(1):52-60. 7. Effect of Nrf2 activators on release of glutathione, cysteinylglycine and homocysteine by human U373 astroglial cells. Steele ML, Fuller S et al. Redox Biol. 2013 Sep 12;1:441-5. 8. Sulforaphane restores cellular glutathione levels and reduces chronic periodontitis neutrophil hyperactivity in vitro. Dias IH, Chapple IL, Milward M et al. PLoS One. 2013 Jun 24;8(6):e66407. 9. Sulforaphane treatment of autism spectrum disorder (ASD). Singh K, Connors SL et al. Proc Natl Acad Sci USA. 2014 Oct 28;111(43):15550-5. 10. Antioxidant functions of sulforaphane: a potent inducer of phase 2 detoxification enzymes. Fahey JW et al. Food Chem Toxicol 1999; 37:973-9.